Don’t forget to eat your greens! Remember your mom or pop telling you that? Well, the greens grown on the Pringle Creek farm are absolutely delicious and they are available to all who subscribe to our CSA. So, instead of cringing, you might be smiling from ear to ear (ahem, you’ve got a little spinach in your teeth…). Community Supported Agriculture is called CSA for short. Now, if you don’t know what it means, no worries. In brief, people in the community pay a farmer in advance for a share in the produce she or he harvests throughout the year. At Pringle Creek Community, we’ve got a bounty that’s not only local but organic. Another cool thing, is that you actually know the people involved in providing that delicious food for you and your family. 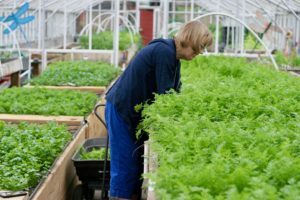 If you want to go even deeper, you can also check-in on how the tomatoes are ripening up, and really get to know the whole process of how fresh produce gets from farm to your table. One of the biggest selling points is that the produce is so much tastier than what you might buy at the store. It’s tastier for a multitude of different reasons including how fresh it is. Some people may think that tomatoes are not their jam. Often tomatoes from your big box grocer aren’t tasty at all, but let me tell you, when you bite into a freshly harvested tomato that’s been ripening in the sun, it’s different. There’s so much flavor! It’s like you’re tasting a completely different fruit altogether (I know, I still can’t get over calling a tomato a fruit either…we’ll leave that discussion for another day). Another sweet reason, just like the tomatoes, is that being a part of a CSA supports local business. When you purchase a share of a CSA, you are supporting a local farmer. How awesome is that? A farmer’s life is definitely a labor of love. So, giving back to our local farmers is important to show that love for your community. It comes full circle, right to nourishing you and your family. Is your mouth watering yet? Are you ready for some fresh and organic produce to mozie your way? You’re in luck. 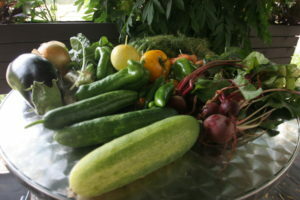 Colleen Owen, our Urban Farmer, has some spots left in the CSA. Please contact us for more info on it. The CSA usually runs from June until January with fresh organic produce about every week, then it slows down to about every other week when it becomes cooler out. The bin of tasty produce is fun, too, because you may also get to try new things! It’s all good in the agrihood.